My name is Emily. I have been a Girl Scout in San Diego for 10 years. Over the past few years I have discovered that I have a passion for helping animals, particularly dogs. My family has fostered several dogs and that is when I decided that this was what I really wanted to do for my Girl Scout Gold Award. In like manner, I am passionate about the well being of all animals and for this reason I have been vegan(the choice to not eat or use any products that come from or are tested on animals) for a year. In conclusion, I hope that you can learn many useful and interesting things on my website and are inspired to "adopt don't shop". What is a gold award? 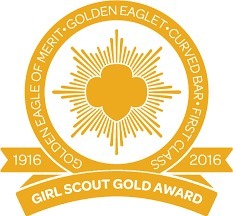 The Girl Scout Gold Award is the highest award that can be earned by a Girl Scout. For the Gold Award, a Girl Scout takes action on an issue in her community that she is passionate about. This project requires the Girl Scout to use and improve her leadership skills, communication skills, and creativity to make a lasting impact on her community. This website is one of the resources for my Gold Award. In my project, I hope to raise awareness about dog rescues in San Diego County with the help of representatives from a couple rescues in San Diego.